When it comes to marketing, B2B can no longer using the age old tactic of push marketing to get more clients. In fact, even to generate leads, they need to first educate their clients and prove their authority in the field. That’s where pull marketing comes in for lead generation. Here’s what is inbound marketing and how it helps in generating more leads for B2B businesses. 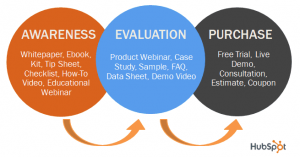 What is inbound marketing in B2B? Inbound marketing is the tactic of drawing in customers to explore your products and services using informational content, social media and search engine optimization. The technique makes use of adding value to the customer and educating them about the product/service being offered, before actually nudging them to convert with them. What’s the first thing you do when you are looking for a new product or service? You resort to the search engine to look for brands and businesses that are offering them. You actually even end up going through a few content pieces around the same to ensure you make the right choice, before actually converting on any one of the offers you see. The consumer today, is not just tech savvy, but is also hungry for information. They want to be able to understand what the product/ service has to offer and how it adds value to them, before they make a commitment. In fact, 62% of consumers are halfway through the sales cycle already before making the first interaction with the brand. That’s where inbound marketing plays an important role. Why choose inbound marketing over outbound? While inbound marketing has been around for a while, there are only 58% of businesses that can say that they have the tactic implemented well. The reason being the lack of understanding on what is inbound marketing, how to measure its success and how it is better than outbound marketing for lead generation. In times when a typical internet user is bombarded with at least 10 advertisements on social media and more than 20 emails in the inbox from different businesses, how do you ensure you get noticed amidst the noise? Now you can’t practically be allocating all your resources towards push marketing or cold calling. When you don’t know if the customer is interested in what you offer or if they have already converted with a competitor, it simply means that you will end up wasting your resources. 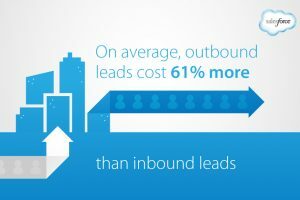 As a result of which, the outbound leads that you do generate will come at a cost much higher! To generate inbound leads consistently, it is important to strategize for the entire sales funnel – right from the point of acquisition to the first conversion, monetization and then, re-engagement with the client. You need to keep in mind how educating your customer further lies at the core of the idea of generating leads in email marketing. But realistically speaking, that’s a whole lot of content that you need to get in place. This is where a smart inbound marketing strategy comes into play to growth hack lead generation. With approximately 6 billion web searches being performed everyday (comScore), it’s a ground rule to start your content marketing from your B2B website. Being right in front of your target market when they are seeking information relevant to your business is the first step in the conversion funnel. The more SEO friendly your site it, the more traffic you pull in and the more traffic you pull in, the greater are the number of leads you generate. What is inbound marketing? Essentially, creating great content and blogging lies at the heard of an inbound marketing strategy. It is one of the best ways to establish an authority in your niche, find and drive quality leads to your sales funnel by simply adding more value to your customers. An insightful blog is one that doesn’t just talk about your product/service features or how they compare to the others in the market. It actually covers the pain points of your target market, generates a demand and offers a comprehensive solution. By using a blog to educate the customer and assist them in the buying process, a B2B business can establish an authority in their niche. The higher up you are in the go-to source of information for your market, the greater are the number of leads that come in from each of the content pieces. The B2B sales process can be long and daunting. It gives enough room to your target market for exploring what your competitors have to offer. The only way to hold them back from doing so, is to make a personalized interaction with them at the early stages of the funnel. Webinars are a great way to hook your audience’s attention. They give you a platform to not just share valuable information with them, but also establish relationships with them early on in the sales cycle. This leads to greater trust and higher number of leads. But often the challenge here, is to get a prospect to show up during the webinar. That’s why you need a strategy to not just get sign ups for your upcoming webinar, but also to keep reminding the leads to attend it. This includes sending them push notifications on web and mobile web, automated reminder emails, social media retargeting and social media interaction. Who doesn’t like to mix business with a little humour? Edutainment is the art of being informative and educational while being entertaining at the same time. Considering how monotonous B2B can get, this is one hack to keep your customers and potential clients engaged with your brand. This video by the Ojai Taxidermy Company was created as a TV commercial and then went viral. In this case, their only point is to create awareness and bring people into their sales funnel: https://www.youtube.com/watch? The idea is to go beyond the definitions of what is inbound marketing and the conventional content formats used by most B2B companies. Experimenting with rich media is a great way to appeal to the internet savvy target market and also boost your SEO at the same time. Instead of just adopting the trend of creating content, focus on understanding what is inbound marketing in a holistic manner and how it works. Identify the areas where your business can establish an authority, what your target market is looking for and first work on creating a documented inbound marketing strategy.